Update: Hello, sudden unexpected influx of visitors from Reddit and Facebook! If you like this schematic there are plenty more like it in the Concept Art section. Also, the comic this site hosts has the same kind of retro-futurist look and feel with great stories the match. You find all of them in the Archives. 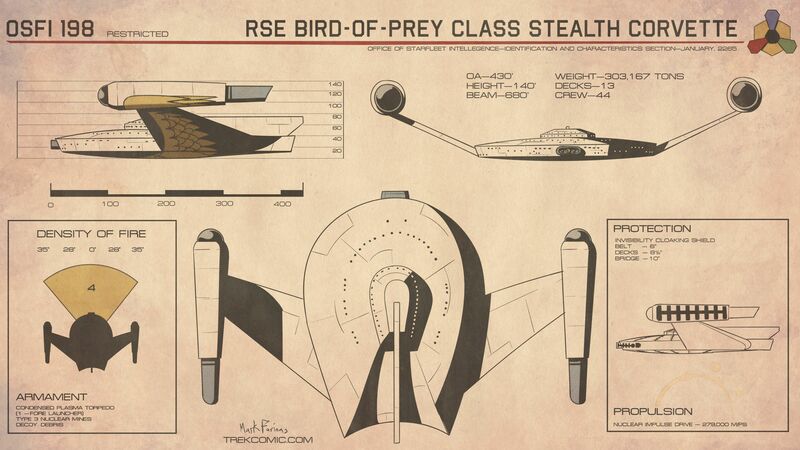 What it lacks in size and speed the Romulan Bird-of-Prey makes up for in firepower and stealth capabilities. Able to weaken the atomic bonds in even the densest materials, the single forward plasma canon has a destructive power beyond current Earth science. The Romulans are also the first power bordering Federation space to develop a practical invisibility shield making sneak attacks on Allied positions across the neutral zone more and more common. With only a series of nuclear reactors to power it, the Bird-of-Prey’s biggest weakness is its delicate energy distribution balance. The drain of firing her main weapon forces the disengagement of her invisibility shield. However, unpowered weapons such as mines and sensor decoys are still launchable with the cloak engaged.